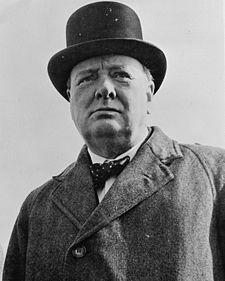 Sir Winston Leonard Spencer-Churchill, KG, OM, CH was a British politician known chiefly for his leadership of the United Kingdom during World War II. He is widely regarded as one of the great wartime leaders. He served as Prime Minister from 1940 to 1945 and again from 1951 to 1955. A noted statesman and orator, Churchill was also an officer in the British Army, a historian, writer and artist. To date, he is the only British Prime Minister to have received the Nobel Prize in Literature, and the first person to be recognised as an honorary citizen of the United States. During his army career, Churchill saw military action in India, the Sudan and the Second Boer War. He gained fame and notoriety as a war correspondent and through contemporary books he wrote describing the campaigns. He also served briefly in the British Army on the Western Front in World War I, commanding the 6th Battalion of the Royal Scots Fusiliers. At the forefront of the political scene for almost fifty years, he held many political and cabinet positions. Before the First World War, he served as President of the Board of Trade, Home Secretary and First Lord of the Admiralty as part of the Asquith Liberal government. During the war he continued as First Lord of the Admiralty until the disastrous Gallipoli Campaign caused his departure from government. He returned as Minister of Munitions, Secretary of State for War and Secretary of State for Air. In the interwar years, he served as Chancellor of the Exchequer in the Conservative government. After the outbreak of the Second World War, Churchill was again appointed First Lord of the Admiralty. Following the resignation of Neville Chamberlain on 10 May 1940, he became Prime Minister of the United Kingdom and led Britain to victory against the Axis powers. Churchill was always noted for his speeches, which became a great inspiration to the British people and to the embattled Allied forces. After losing the 1945 election, he became Leader of the Opposition. In 1951 he again became Prime Minister, before finally retiring in 1955. Upon his death, the Queen granted him the honour of a state funeral, which saw one of the largest assemblies of statesmen in the world. There is nothing more thrilling than to be shot at without result.